Carol Ohmart, 74, American actress and model. Phillomena Alecia "Bonnie" Mealing was an Australian freestyle and backstroke swimmer of the 1920s and 1930s, who won a silver medal in the 100-metre backstroke at the 1932 Summer Olympics in Los Angeles, the first Australian to win a medal in backstroke. The women's 100 metre backstroke was a swimming event held as part of the swimming at the 1932 Summer Olympics programme. It was the third appearance of the event, which was established in 1924. The competition was held on Tuesday August 9, 1932, and on Thursday August 11, 1932. Armi Aavikko, 43, Finnish beauty queen and singer. Zac Foley, 31, bass guitarist for EMF. Michael Howe, 61, British psychologist. Armi Anja Orvokki Aavikko was a Finnish beauty queen and singer. She was chosen as Miss Finland in 1977 and was best known for her duets with singer Danny. EMF are a British alternative rock band from Cinderford, Gloucestershire, who came to prominence at the beginning of the 1990s. During their initial eight-year run from 1989 to 1997, EMF released three studio albums and had gone on hiatus and reformed twice. Their first single, "Unbelievable", reached #3 on the UK Singles Chart, and was a #1 hit on the U.S. Billboard Hot 100 chart. Their debut album, Schubert Dip, went to #3 on the UK Albums Chart. Satish Dhawan, 81, Indian aerospace engineer. Freddy Heineken, 78, Dutch beer magnate. John Gabriel Parkes, 84, British businessman. Ruby Ficklin Bryant was the ninth chief of the United States Army Nurse Corps. She received the Legion of Merit for her services to the government. The United States Army Nurse Corps was formally established by the U.S. Congress in 1901. It is one of the six medical special branches of officers which – along with medical enlisted soldiers – comprise the Army Medical Department (AMEDD). 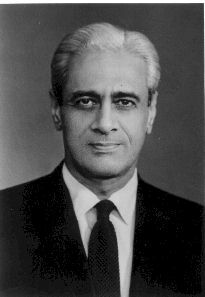 Satish Dhawan was an Indian mathematician and aerospace engineer, widely regarded as the father of experimental fluid dynamics research in India. Born in Srinagar, Dhawan was educated in India and further on in United States. Dhawan was one of the most eminent researchers in the field of turbulence and boundary layers, leading the successful and indigenous development of the Indian space programme. He succeeded Vikram Sarabhai, as chairman of the Indian Space Research Organisation (ISRO) in 1972. Georg Ericson, 82, Swedish football (soccer) player and coach. Michael Howard, 79, English choral conductor, organist and composer. Nathan Ross Chapman was a United States Army Sergeant First Class with the 1st Special Forces Group. He was the first American soldier to be killed in combat in the war in Afghanistan. Helen Crabtree was an American equitation coach in the discipline of saddle seat riding as well as a breeder and trainer of American Saddlebred horses. In 1970, she authored the book Saddle Seat Equitation which remains a primary guide for equitation riders. Crabtree Stables, which she ran with her husband Charles and son Redd, produced 75 World Champion American Saddlebred horses and 22 winners of the National Equitation Championships. Christie Harris, 94, Canadian children's writer. Astrid Henning-Jensen, 87, Danish film director, actress, and screenwriter. Kamel Maghur, 67, Libyan lawyer and diplomat. Raza Naqvi Wahi, 87, Indian poet. Igor Cassini was an American syndicated gossip columnist for the Hearst newspaper chain. He was the second journalist to write the Cholly Knickerbocker column. Cholly Knickerbocker is a pseudonym used by a series of society columnists writing for papers including the New York American and its successor, the New York Journal-American. William Randolph Hearst Sr. was an American businessman, newspaper publisher, and politician known for developing the nation's largest newspaper chain and media company, Hearst Communications. His flamboyant methods of yellow journalism influenced the nation's popular media by emphasizing sensationalism and human interest stories. Hearst entered the publishing business in 1887 with Mitchell Trubitt after being given control of The San Francisco Examiner by his wealthy father. Heinz Heuer, 83, Nazi military police officer. Louise B. Johnson, 77, American politician. Johnnie Mae Matthews, 79, American blues and R&B singer, songwriter, and record producer, cancer. Mario Nascimbene, 88, Italian film soundtrack composer. Marian Wenzel, 69, British artist and art historian, cancer. Jon Lee, 33, British drummer (Feeder). Mighty Igor, 70, American professional wrestler, heart attack. David McWilliams, 56, Northern Irish singer-songwriter ("Days of Pearly Spencer"). Fred Tappert, 61, American physicist. Cedric Smith, 84, British statistician. Peggy Antonio, 83, Australian cricketer. Gerrit Brokx, 68, Dutch politician. Julian Faber, 84, English business executive. Christer Strömholm, 83, Swedish photographer. Henri Verneuil, 81, French filmmaker and playwright. Robert Francis Ruttledge, 102, Irish ornithologist. Edward Ellis, 83, British naval officer. Gregorio Fuentes, 104, Cuban sailor. Antonije Isaković, 78, Serbian writer. Ferdinand Weiss, 69, Romanian pianist. Ebenezer Ako-Adjei, 85, Ghanese politician. Sir Nicolas Cheetham, 91, British diplomat. Michael Young, Baron Young of Dartington, 86, British sociologist, social activist and politician. David Hamer, 78, Australian politician. Antonio Sbardella, 76, Italian football player, referee and sports official. Olav Selvaag, 89, Norwegian engineer. Jean Dockx, 60, Belgian football player and manager. Jeremy Hawk, 83, British actor ( Elizabeth ). David McEnery, 87, American artist and musician. Vithabai Bhau Mang Narayangaonkar, Indian artist. Kevin O'Donnell, 77, Australian rules footballer. Bobo Olson, 73, American boxer. Michel Poniatowski, 79, French politician. Ron Taylor, 49, American actor ( The Wiz , The Simpsons , Rover Dangerfield ). Michael Walford, 86, British sportsman. Brian Simon, 86, British educationalist and historian. Jovdat Hajiyev, 84, Azerbaijani composers of the Soviet period. Alex Hannum, 78, American basketball coach. Marilyn Harris, 70, American author. Jeff Astle, 59, English footballer. Roy Conrad, 61, American actor ( Patch Adams , Casino , Titan A.E. ). Carrie Hamilton, 38, American actress ( Cool World , Fame ). John Jackson, 77, American blues musician. Luule Viilma, 51, Estonian doctor, esotericist and practitioner of alternative medicine, car crash. John Whitehead, 77, American football coach. Jorma Karhunen, 88, Finnish Air Force ace. Marjorie Lewty, 95, British writer. Charlie Puckett, 90, Australian sportsman. Makhan Singh, 64, Indian athlete. Zenon Snylyk, 68, Ukrainian-American soccer player. Eric de Maré, 91, British architectural photographer and writer. Salomon Tandeng Muna, 89, Cameroonian politician. Benny Rothman, 90, British political activist. Nunzio Filogamo, 99, Italian television and radio presenter, actor and singer. Peter Gzowski, 67, Canadian broadcaster, writer and reporter, emphysema. Kurt Schaffenberger, 81, American comics artist. Gregorio Walerstein, 88, Mexican film producer and screenwriter. Chris Perry, 73, Indian musician, composer, songwriter and film producer. Winston Place, 87, English cricketer. Kenneth Yasuda, 87, Japanese-American scholar and translator. John James, 87, British racing driver. Abelardo Raidi, 87, Venezuelan sportswriter and radio broadcaster. Astrid Lindgren, 94, Swedish writer of fiction and screenplays. Billy O'Rourke, 41, English professional footballer, brain haemorrhage. Jack Witikka, 85, Finnish film director and screenwriter. Stephen Wayne Anderson, 48, American murderer, execution by lethal injection. Erik Dons, 86, Norwegian diplomat. Richard Grenier, 68, American columnist and film critic, heart attack. Heinz Hennig, 74, German choral conductor and an academic teacher. Stratford Johns, 76, South African-born British stage, film and television actor, heart disease. Night Train Lane, 74, American football player, heart attack. James Marjoribanks, 90, British diplomat. Phil McCall, 76, British actor. Martin Magner, 101, German-American theatre-, radio-,and television director, cancer. Henry Kloss, 72, American audio engineer and entrepreneur. ↑ Bonnie Mealing, Sports-Reference / Olympic Sports. Retrieved 2019-02-23. ↑ Kinzer, Stephen (2002-01-13). "Pablo Antonio Cuadra, 89, Nicaraguan Poet". The New York Times . Retrieved 2019-04-03. ↑ Sarnecky, Mary T. "Colonel Ruby F. Bryant 9th Chief, Army Nurse Corps". United States Army Nurse Corps . Retrieved 2019-03-18. ↑ McLellan, Dennis (2002-01-05). "Miklos 'Miki' Dora, 67; Rebel Surfer". Los Angeles Times . Retrieved 2019-04-06. ↑ Pareles, Jon (2002-01-11). "Juan García Esquivel Dies; Pop Composer Was 83". The New York Times . Retrieved 2019-04-15. ↑ Livacari, Gary. "Al Smith". Society for American Baseball Research . Retrieved 2019-02-19. ↑ "Killed soldier devoted to family, country, parents say". CNN . 2002-01-06. Retrieved 2019-03-22. ↑ "Legendary Equestrian Helen K. Crabtree". Equisearch. 2002-01-05. Retrieved 2019-04-03. ↑ "Douglas Jung, C.M., C.D." Parliament of Canada . Retrieved 2019-02-23. ↑ "Adrián Zabala". Baseball-Reference.com . Retrieved 2019-02-19. ↑ Oliver, Myrna (2002-01-10). "Igor Cassini, 86; Wrote N.Y. Society Column". Los Angeles Times . Retrieved 2019-03-21. ↑ Valentin Chernikov, Sports-Reference / Olympic Sports. Retrieved 2019-03-22. ↑ Hrebeniak, Michael (2002-04-05). "Fielding Dawson". The Guardian . Retrieved 2019-04-04. ↑ Morris, Edward (2002-01-09). "Bobby Austin, of "Apartment No. 9" Fame, Dead at 68". CMT . Retrieved 2019-03-12. ↑ Per-Arne Berglund, Sports-Reference / Olympic Sports. Retrieved 2019-03-15. ↑ "Mr. Sanya Dharmasakti". soc.go.th. Retrieved 2019-04-05. ↑ O'Connor, Anahad (2002-01-14). "Burton I. Edelson Dies at 75; NASA Space Science Leader". The New York Times . Retrieved 2019-04-08. ↑ Nemec, David. "Fred Taylor". Society for American Baseball Research . Retrieved 2019-02-19. ↑ Wainwright, Martin (2002-01-16). "Frank Cave". The Guardian . Retrieved 2019-03-21. ↑ "Geoff Crompton". Basketball-Reference.com. Retrieved 2019-02-23. ↑ "Geoffrey Crossley". Motor Sport, United Kingdom. Retrieved 2019-02-23. ↑ "Hal Marnie". Baseball-Reference.com . Retrieved 2019-02-19. ↑ The Associated Press (2002-01-09). "Avery Schreiber, 66, Doritos Funnyman". The New York Times . Retrieved 2019-02-23. ↑ Saxon, Wolfgang (2002-01-16). "D. Eugene Strandness Jr., 73, Innovator in Vascular Medicine". The New York Times . Retrieved 2019-02-23. ↑ Besag, Julian; Clifford, Peter. "Maurice S Bartlett" (PDF). Institute of Mathematical Statistics . Retrieved 2019-03-13. ↑ "Plane plunge death 'not suspicious'". BBC News . 2002-01-10. Retrieved 2019-03-18. ↑ Stanko Despot, Sports-Reference / Olympic Sports. Retrieved 2019-04-05. ↑ "A. Prokhorov, 85; Physicist". Los Angeles Times . 2002-01-11. Retrieved 2019-02-23. ↑ Benjamín Casado, Sports-Reference / Olympic Sports. Retrieved 2019-03-21. ↑ Alan Christie, Sports-Reference / Olympic Sports. Retrieved 2019-03-23. ↑ Mush March, Sports-Reference / Hockey-Reference.com. Retrieved 2019-02-23. ↑ Andrew Boyd, Sports-Reference / Olympic Sports. Retrieved 2019-03-17. ↑ Castillo, Alfonso A. (2002-01-19). "John Buscema, 74; Comic Book Artist". Los Angeles Times . Retrieved 2019-03-19. ↑ Lobdell, William (2002-01-11). "W.A. Criswell, 92; Leader of Literal-Bible Movement". Los Angeles Times . Retrieved 2019-04-03. ↑ Budd, Chris; Peregrine, Howell (2003-03-01). "Philip Gerald Drazin". Physics Today . Retrieved 2019-04-07. ↑ John Berger, Sports-Reference / Olympic Sports. Retrieved 2019-03-14. ↑ Goodman, Geoffrey (2002-01-13). "Moss Evans". The Guardian . Retrieved 2019-04-15. ↑ "McSWEEN, Harold Barnett, (1926 - 2002)". Biographical Directory of the United States Congress . Retrieved 2019-02-23. ↑ "Ernest Pintoff, 70; Animator Won Oscar". Los Angeles Times . 2002-02-07. Retrieved 2019-02-24. ↑ "Stanley Unwin: Comedian who had a special way with words". The Guardian . 2002-01-15. Retrieved 2019-02-23. ↑ "Richard Bolt". Sound & Science: Digital Histories. Retrieved 2019-03-16. ↑ Christian Robert von Bülow, Sports-Reference / Olympic Sports. Retrieved 2019-03-18. ↑ Munoz, Lorenza (2002-01-15). "Ted Demme, 37; Director of Movies 'Blow,' 'Beautiful Girls'". Los Angeles Times . Retrieved 2019-02-23. ↑ Ross, Clark W.; Nygaard King, Betty (2007-04-29). "Samuel Dolin". The Canadian Encyclopedia . Retrieved 2019-04-06. ↑ "FANNIN, Paul Jones, (1907 - 2002)". Biographical Directory of the United States Congress . Retrieved 2019-02-23. ↑ Martin, Douglas (2002-01-25). "Edith Bouvier Beale, 84, 'Little Edie,' Dies". The New York Times . Retrieved 2019-02-23. ↑ Graham, Ted (2002-01-23). "Harold Campbell". The Guardian . Retrieved 2019-03-20. ↑ Martin, Douglas (2002-01-17). "Michael Bilandic, Daley Successor in Chicago, Dies at 78". The New York Times . Retrieved 2019-02-23. ↑ Tucker, Anthony (2002-01-18). "Robert Hanbury Brown". The Guardian . Retrieved 2019-03-18. ↑ Dorr, Robert F. (2018-11-20). "Medal of Honor Recipient: Henry "Red" Erwin". Warfare History Network. Retrieved 2019-04-09. ↑ Barker, Dennis (2002-01-21). "Peter Adamson". The Guardian . Retrieved 2019-03-09. ↑ Hare, David (2002-01-20). "Diana Boddington". The Guardian . Retrieved 2019-03-16. ↑ Eaude, Michael (2002-01-18). "Camilo José Cela". The Guardian . Retrieved 2019-03-21. ↑ "Mr (Jim) James Alexander CAMERON (1930 - 2002)". Parliament of New South Wales . Retrieved 2019-03-19. ↑ "John Aveni". Pro-Football-Reference.com . Retrieved 2019-03-12. ↑ "Walter C. Carter, M.P." Parliament of Canada . Retrieved 2019-03-21. ↑ Max Angst, Sports-Reference / Olympic Sports. Retrieved 2019-03-11. ↑ "Rolando Barral, 62; Actor, Talk Show Host". Los Angeles Times . 2002-01-24. Retrieved 2019-03-13. ↑ Thurber, Jon (2002-01-23). "Peggy Lee, Sultry Jazz and Pop Singer, Dies at 81". Los Angeles Times . Retrieved 2019-02-23. ↑ The Associated Press (2002-01-23). "John Love, 85; Was Colorado Governor". Los Angeles Times . Retrieved 2019-02-23. ↑ "George Trapp". Basketball-Reference.com. Retrieved 2019-02-23. ↑ Oliver, Myrna (2002-02-08). "Sheldon Allman, 77; Actor, Songwriter, Cartoon Voice". Los Angeles Times . Retrieved 2019-02-23. ↑ Salewicz, Chris (2002-01-31). "Peter Bardens". The Independent, London. Retrieved 2019-03-13. ↑ Guido Bernardi, Sports-Reference / Olympic Sports. Retrieved 2019-03-15. ↑ Leigh, Spencer (2002-04-06). "Hank Cosby". The Independent, London. Retrieved 2019-04-03. ↑ "George Dickerson, 88; UCLA Coach and Hall of Fame Athlete". Los Angeles Times . 2002-01-31. Retrieved 2019-04-05. ↑ Moore, Booth (2002-02-06). "Jean Patchett, 75; Fashion Model for Ford Made 40 Magazine Covers". Los Angeles Times . Retrieved 2019-02-24. ↑ Jack Shea, Sports-Reference / Olympic Sports. Retrieved 2019-02-24. ↑ "Paul Aars". Racing-Reference.info. Retrieved 2019-03-09. ↑ Oliver, Myrna (2002-01-30). "Louis Benezet, 86; College Innovator". Los Angeles Times . Retrieved 2019-03-14. ↑ "Pierre Bourdieu, 71; Sociologist and Philosopher". Los Angeles Times . 2002-01-27. Retrieved 2019-03-17. ↑ "Charlie Bradshaw". Pro-Football-Reference.com . Retrieved 2019-03-17. ↑ Rogers, Rick (2002-01-25). "OU's Thomas Carey dies". The Oklahoman . Retrieved 2019-03-20. ↑ Barnes, Peter (2002-01-27). "Stuart Burge". The Guardian . Retrieved 2019-03-18. ↑ Haldane, David (2002-01-25). "Paul Carpenter, 73; Former Legislator Went to Prison". Los Angeles Times . Retrieved 2019-03-20. ↑ Brooks, Nancy Rivera; Romney, Lee; Streitfeld, David (2002-01-26). "Former Enron Exec Found Dead in Apparent Suicide". Los Angeles Times . Retrieved 2019-03-13. ↑ "The Honourable Willard Zebedee Estey". Supreme Court of Canada . 2008-09-04. Retrieved 2019-04-15. ↑ Francisco Cabañas, Sports-Reference / Olympic Sports. Retrieved 2019-03-19. ↑ Myer, Clive (2002-01-30). "Obituary: Dorothy Carrington". The Guardian . Retrieved 2019-03-21. ↑ McLellan, Dennis (2002-02-07). "Rudolph B. Davila, 85; Medal of Honor Given 56 Years After Feat". Los Angeles Times . Retrieved 2019-02-24. ↑ Thurber, Jon (2002-02-20). "Loonis McGlohon, 80; Wrote Hundreds of Songs". Los Angeles Times . Retrieved 2019-02-27. ↑ "Ray Yochim". Baseball-Reference.com . Retrieved 2019-02-19. ↑ Woo, Elaine (2002-02-24). "R. Chapman, 81; Wordsmith, Roget's Editor". Los Angeles Times . Retrieved 2019-03-02. ↑ Saxon, Wolfgang (2002-02-08). "John Cooper, 83; Led Medical Colleges Group". The New York Times . Retrieved 2019-03-24. ↑ "Reggie Sanders". Baseball-Reference.com . Retrieved 2019-02-19. ↑ Lueck, Thomas J. (2002-01-30). "Andrew W. Cooper, 74, Pioneering Journalist". The New York Times . Retrieved 2019-03-24. ↑ "Gustaaf Deloor". Cycling Archives. Retrieved 2019-04-05. ↑ "Suzanne Bloch, 94; Musician, Teacher and Early Music Specialist". Los Angeles Times . 2002-02-18. Retrieved 2019-03-16. ↑ "Florian Côté, M.P." Parliament of Canada . Retrieved 2019-04-03. ↑ O'Grady, Jane (2002-02-01). "Richard Hare". The Guardian . Retrieved 2019-02-26. ↑ Thurber, Jon (2002-02-01). "Harold Russell, 88; Disabled Actor Won 2 Oscars for 'The Best Years of Our Lives'". Los Angeles Times . Retrieved 2019-02-23. ↑ Woo, Elaine (2002-02-02). "Inge Morath, 78; Magnum Portrait Photographer". Los Angeles Times . Retrieved 2019-02-24. ↑ Lou Salica, Sports-Reference / Olympic Sports. Retrieved 2019-02-23. ↑ "Jim Camp". Pro-Football-Reference.com . Retrieved 2019-03-19. ↑ Castelletti, Anthony. "Harry Chiti". Society for American Baseball Research . Retrieved 2019-02-19. ↑ Oliver, Myrna (2002-02-04). "Francis Gabreski, 83; Pilot Was War Hero". Los Angeles Times . Retrieved 2019-02-24. ↑ Oliver, Myrna (2002-02-13). "Evelyn Scott, 86; 'Peyton Place' Actress, First Female DJ on L.A. Radio Station". Los Angeles Times . Retrieved 2019-02-23.